Treat your guests to a touch of royalty with our sparkling tiara keychains! 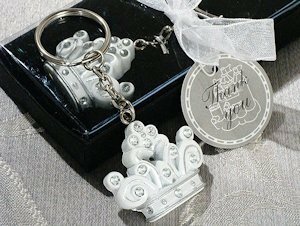 Each uniquely designed keychain favor has a jewel encrusted tiara resin charm attached to a chrome metal key ring - a perfect addition to your fairytale day. Each favor is packaged in a black bottom gift box with a clear top and then tied with an organza ribbon and finished with a fairytale themed thank you tag. Measures 3" long.